Nothing that quite compares to the feeling any genealogist has, sitting there, holding in your hand, a piece of your own family history. And thanks to the Texas State Library and Archives (TSLA), that’s the feeling The Legal Genealogist has had these past few days… and why I’m having such mixed feelings today. On one hand, I’m looking forward, as always, to the Southern California Genealogical Society’s DNA Day and Jamboree. It gets underway tomorrow at the Marriott in Burbank, and I’m looking forward to seeing old friends and meeting new ones. On the other hand, it’s awfully hard to leave Texas today… and leave my family history behind. Jelain Chubb, Texas State Archivist, and her staff have built and are continuing to expand an amazing array of documents and artifacts of historical and genealogical value at TSLA, and it’s got a wealth of material to offer to anyone with Texas roots. For genealogists, TSLA’s holdings include vital statistics indexes, an index to Confederate pension applications, Adjutant General service records, Republic of Texas claims, Confederate indigent families lists, county tax rolls, city directories, 1867 voters’ registration, Texas convict record ledgers and indexes, and Republic of Texas passports — just to name a few. There’s an astonishingly broad manuscript collection, maps, prints and photographs, including a wide variety of Sanborn fire insurance maps in full color, audio and video histories and so much more. An extensive microfilm collection — including county records and a wide variety of newspapers — matches up with reader-scanner equipment so users can bring digital copies of microfilmed documents home with them. Folks with Texas ancestry looking to see what TSLA might have to offer their research efforts can check into the Genealogy Resources Available at Our Library web page at the TSLA site; a guide to the Online Collections provides an in-depth look at what’s available online. TSLA is open five days a week, Monday through Friday, 8 a.m. to 5 p.m. and 9:00 a.m. to 4:00 p.m. on the second Saturday of each month. There are computer terminals with access to all the major online databases such Ancestry and Fold3, and an easy-to-use scanner any visitor can use even for personal scanning like family photographs. I owe a great big thank you to Teri Flack, a member of the Austin Genealogical Society and a volunteer at TSLA, for arranging a chance for me to tour the Archives and get an idea from Jelain Chubb of what the future might hold… like those Supreme Court cases. But the biggest thanks I owe is for being able to sit there and hold those records in my hands. My great grandfather Jasper Robertson was a guard in the Texas state prison system from 1893 through 1900. Every time he picked up a monthly paycheck, he had to sign a ledger sheet showing he’d been paid. And though the records have been digitized, and I could see them online, there’s nothing in this world that quite compares to the feeling you have, sitting there, holding in your hand, a piece of your own family history. The very last payroll signature my great grandfather inked, before leaving for Oklahoma in June of 1900. Kudos to the Texas State Library and Archives. TSLA is near and dear to my heart — and I’ve never been there! They provided copies of letters from my gg-grandfather that he sent to his wife back in Lexington, KY. He had volunteered for the Texas War for Independence as a “fife” player. I also have copies of land warrants, including one issue to him when Texas was the Republic of Texas. I found their personnel to be EXTREMELY helpful in my research. The archivist and her staff are fabulous, Kathy. One searched and searched and searched until she found some records that weren’t even well-catalogued that answered a whole bunch of questions I had about my great grandfather’s work history. Great team there!! Hope to visit this wonderful library some day. I know the feeling you had holding the old documents. I got to hold the marriage record of my 4-Great grandparents in Amherst County, Virginia dated 12 November in the historical year of 1776. Her father signed giving permission and three of her brothers were witnesses. That’s wonderful, Kat! Those documents are so precious to us. TSLA is a wonderful place for research. 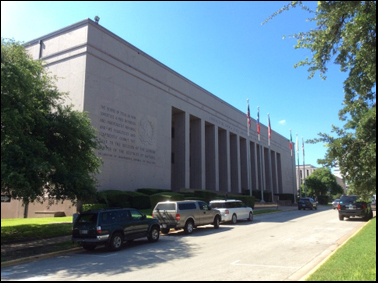 Where else could a Texas researcher obtain a record from the Texas Court of Criminal Appeals–or from the Texas State Orphan Home? One of my favorites is the WPA records http://www.lib.utexas.edu/taro/utcah/01355/01355-P.html These include county scrapbooks from the 1930s (and beyond) about old timers’ reunions, deaths of prominent citizens, etc. There is also a card file (not online) of WPA inventories of county records. For some counties, there are abstracts of probate records.